The Setting is a satirically re-imagined World. Disclaimer: The producers of this video game concept are not endorsing or condoning any criminal activities described in this video game concept. This video game concept is entirely fictional, so any resemblence to real life people or events is entirely coincidental. It's 2017. Jake Lee is a third generation American expatriot of Hong Kong, who is coming back from military service in Afganistan. His grandfather moved to ASU during the financial boom in the 60's as an illegal immigrant to San Fierro, but became a citizen through marriage, and moved to Liberty City, because there was a bunch of relatives there. What he did't know was the relatives worked for the triads, so that's what Jake's father had to do too. He never spoke about his business to his own family. It was only by accident that Jake found out. That was when Jake enlisted for the military, and served in Afganistan. Lucky for Jake, he never caught a bullet, but he nearly died in a roadside bombing. Two guys from his unit perished that day and one after a week at a hospital. Jake is sent home. When he gets home, his mother tells him that his father has died. At the funeral, Jake is approached by a member of the triad to come and see the head of the triads, of which it would be impossible to decline. The triad head knows Jake served in the military, and wants him to join the triad, a secret society, of which there would be great benefits. But joining means also, that he has to stay with the organization until his death, and never speak about it to outsiders or even his family members. And then he says, that because of the secrecy, he is to be killed anyway, if he decided not to join. So he joins. Then and there he becomes a rookie, and is given missions to complete. After he proves loyalty and skill, he is given more demanding missions all over the world and during them he gains contacts and friends. Each level lasts for a year and after 10 years Jake is promoted second in command. Jake is given the task of the international head by the triad head, and he meets all the triad heads and their seconds in command in Hong Kong and learnes about the situation all over the world. Jake is the right-hand man of the Triad head and performes tasks for him and makes sure his word is the law for the other members of the organization.Global empire building begins and Jake needs to travel the globe, take care of business and enjoy what little spare time he has. Then after 10 years the triad head dies of old age, and Jake is promoted to triad head. Now you get to do what you like (except to leave the triad). 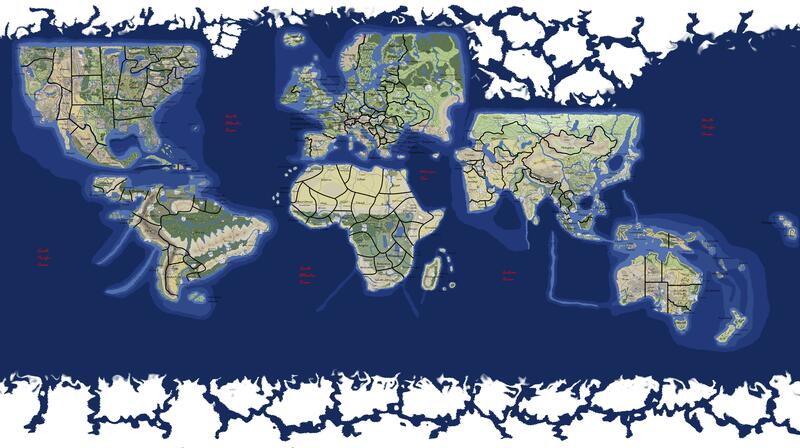 To see the map in it's whole glory, click on the picture, then move your cursor off the picture and then when you move the cursor back on the picture, you can open the picture in another window by clicking on it. Click it again and Voila! The map is in the form of a Globe, so that distances are shorter and day/night cycle is easier to make. Same procedure to see the full map as in the previous map. You start as a consultant, advance into coordinator and finally the manager. As "consultant" you get sent to places, that are late on payment, or not paying, while they're supposed to. Your job is to convince, that it's in the best interest of the owner to pay up. Your pay is at first: $500 per day, level 2: $1,000, level 3: $2,000. As "coordinator" your job is to apply people to trouble spots, and to take care of competition. You hire and fire consultants. Your pay is at first a 5% commision, level 2: 10%, level 3: 20%. As "manager" you decide where you operate, hire and fire coordinators after each week, and decide the rates. You have to pay half of your earnings as a tribute to the triad head. You start as a chauffer, advance into procurement manager and finally accomodation manager. As "chauffer" you drive your employees to the best suited spots, choose the working outfits for the employed women, make sure customers pay up and don't damage the goods. You take care of competition and your employees. You get half of every dollar your employees make, then have to pay half as a tribute to Procurement manager. As "procurement manager" you advertise the business, make decisons about the look and feel of the whorehouse and find out what the customers desire. You make sure each encounter with personnel is recorded in video and audio, and make sure that the business is disguised as a legitimate business. You get the tribute paid to you, then have to pay half as a tribute to Accomodation manager. As "accomodation manager" you decide the scale of operation, you hire and fire personnel. You get the tribute paid to you. You have to pay half of your take to the triad head. As "collector" you convince customers that it's in their best interest to pay up. Your pay is at first: $500 per day, level 2: $1,000, level 3: $2,000. As "cash manager" you hire and fire personnel and decide rates after each week. You have to pay half of your earnings to triad head. As "guard" you let the right people in and keep the wrong people out. At first level you get paid 5% of winnings, second level 10% and third 20%. As "manager" you invite fighters, set entrance fees for audience, hire guards, packers and accountants before each event. You pay half of your share to the triad head as a tribute. As "picker" you hold out small stores and gas stations using a fast car, mask and a gun. A good stick up is a two-man job. You have to pay 20% of the take to the logistics executive for planning and intelligence. As "evening cashier" you enter into peoples homes and businesses while they are away using stealth and a van. A good burglary is a three-man job. You have to pay 20% of the take to the logistics executive for planning and intelligence. As "account manager" you enter into businesses while they are in a vulnerable state, when a lot of cash or valuables is on their hands, and all security disabled. A good big heist is a five-man job. You have to pay 20% of the take to the logistics executive for planning and intelligence. As "logistics executive" you do the intelligence, plan the heists, hire the crews before the job, then take 20% of the action and divide the spoils after each job. You pay half of your take to the triad head. As "sales clerk" you fetch the product from your stash and go to your corner to sell it to customers. You also take care of competition, authorities and angry customers and give free samples to test the product. At first level you get 5% of each sale, second level 10%, third level 20%. As "delivery driver" you fetch the product from the supplier and take it to a stash, take care of competition and authorities. You also move the product from stash to stash. At first level you get $500 for each delivery, second level $1,000, third level $2,000. As "production manager" you negotiate for deals with suppliers and hire and fire women to work in your production facilities before each batch. You decide how strong a product you buy and how much you cut it. Then you make sure it gets tested and sold. You pay half of your take as tribute to the triad head. As "deckhand" you make sure no-one escapes before sale, and that the product is in good condition before sale. At first level you get $500 for each trip, second level $1,000, third level $2,000. As "supervisor" you monitor the product quality and the working morale of the workers and intervene with punishments, if there's anything wrong with either. At first level you get paid $2,500 per batch, second level $5,000 and third level $10,000. As "CEO" you negotiate with suppliers and customers and hire personnel before each batch. You pay half of your take to the triad head as a tribute. As "pilot" you operate any vehicle carrying the cargo. At first level you get payed $2,500 per run, second level $5,000 and third $10,000. As "merchant" you negotiate the deals with suppliers and customers, and hire personnel before each run. You pay half of your take to triad head. As "laborer" you pick the crates from the countryside with a helicopter and load them into a van. At first level your pay is $500 per run, second level $1,000 and third level $2,000. As "driver" you drive the van to airport hangar, or to the seaport. At first level your pay is $2,500 per run, second level $5,000 and third level $10,000. As "managing director" you purchase the product from the supplier and sell it to customers. You hire personnel before each run. You pay half of your take to triad head. You start as a fetcher, andvance into guide and finally to safari hoast. As "fetcher" you fetch the product to the crate. At first level you get $500 for each run, second level $1,000 and third level $2,000. As "guide" you drive the safari vehicles to places where there are target animals. You wait until the safari guests shoot the targets with tranqualizers, and then move to another place. At first level you get $2,500 for each run, second level $5,000 and third level $10,000. As "safari hoast" you market the safari to the public. You hire personnel before each run. You sell the products to customers and pay half of your take to the triad head. As "dispatch supervisor" you pilot a vehicle and collect the crate(s) from a drop off point and drive it(them) to another drop off point. At first level you get $500 for each job, second level $1,000 and third level $2,000. As "transportation coordinator" you define routes for delivery and assign dispatch supervisors their jobs. At first level your pay is $2,500 per run, second level $5,000 and third level $10,000. As "warehouse manager" you hire and fire dispatch supervisors and transportation coordinators after each run and sell your services to customers and pay half of your earnings to triad head. You start as ensign, advance into lieutenant and finally commander. As "ensign" you act as a storm trooper and have a hands-on approach to the business. At first level you get $500 for each job, second level $1,000 and third level $2,000. As "lieutenant" you steer the vessels and fire the guns of the vessel. At first level your pay is $2,500 per run, second level $5,000 and third level $10,000. As "commander" you pick the targets, assign vessels and define routes. You decide what you take from the vessel you cought, whether you keep her or not. You get the loot and pay half of your take to the triad head. As "janitor" your job is to sanitize a hit that made a mess. You must get rid of any incriminating evidence, including bodies, wittnesses, weapons, fingerprints etc. At first level you get $500 for each job, second level $1,000 and third level $2,000. As "head hunter" your job is to perform efficient and timely hits, while avoiding unnecessary attention. At first level you get payed $2,500 per hit, second level $5,000 and third level $10,000 You have the option of calling cleaner, but it'll cost ya. As "event manager" you must hire and fire your squad members before each hit, lead the hit squad in squad hits and negotiate with customers. You pay half of your take to the triad head. As "sales assistant" you scan the place for vehicles in demand, and send a photo with gps coordinates and a time stamp as an e-mail. At first level you get payed $100 per photo, second level $200 and third level $400. As "vehicle test driver" you scan your phone for messages from "sales assistant" and steal the vehicle before it vanishes and deliver it to a lockup near a chop-shop or a hangar on an abandoned airfield and e-mail to "showroom manager". At first level you get payed $500 per delivery, second level $1,000 and third level $2,000. As "Showroom manager" you send requests by e-mail to the "sales assistant". You adjust your list of orders according to customers preferences. You hire and fire personnel after each week and negotiate with customers. You pay half of your take to the triad head. As "investigator" your job is to follow the targets, go through their trash, take pictures and footage of their unexpected encounters, collect incriminating evidence and to set the target up when ordered to do so. At first level you get payed $500 per case, second level $1,000 and third $2,000. As "client advisor" your job is to intimidate the target with bullying and displaying physical power. At first level you get payed $2,500 per case, second level $5,000 and third $10,000. As "negotiator" you give offers that can't be refused by using leverage or financial compensation or services required by the official. You also hire and fire personnel after you accept each case. At first level you get payed $12,000 per case, second level $24,000 and third $50,000. There would be an incentive to check the functioning fuel gauge right after stealing a ride. Everything from anti-tank missiles to armor piercing bullets, no waiting period, use your second amendment rights! Fund the organized crime and buy our tax and duty free weapons stolen from the government! Nice to see you make a full concept out of your great map. I really like the rackets you've listed, I can see myself spending 99% of my gametime doing those alone. Only thing I would suggest so far is to organize your info - specifically your cars - into tables so they're easier to digest. Do you plan on writing out missions? No, I don't really do missions, but if you would like to help, you can do them. Doing something Jake likes raises his mood, and therefore he is more focused and thereby his performance is better. Doing something Jake doesn't like lowers his mood, and therefore makes him angry or fearful and thereby he makes more errors. You can have Jake read a book about something (interactive). And reading will improve his skills. and he will be able to read more efficiently the more he reads. That will have an effect on the skills of Jake. Reading will give Jake vocabulary to use in converstation, and reading about a specific subject will give Jake more options in gameplay.e.g. reading a book about guns will improve Jake's gun skills. And more different guns will become available. Jake can quote tv commercials and tv programs. Like in IV where Niko makes comments based on differing tv programs. Jake can quote the movies he has seen and learn the moral of the story. Jake can search the ingame internet for multiple subjects, and find more hobbies to play. It will also allow online shopping and banking. Also e-mail and blogs. LifeInvader, Bleeter, and Snapmatic also. Jake can have discourse with family members, show affection to them and pets, make comments about their behavior and appearance and listen to their comments as well as react to them in accordance with what Jake has learned so far during gameplay. Jake can keep the catch or release it. If Jake chooses to keep it, it can be sold or prepared for a meal. Depending on a place you can catch fishes or small items. To do fishing you should be in a possession of a boat, fishing rod and bait. Jake should be in a posession of a gun, and have enough shooting skill and hunting skill to begin hunting. He can get that from books about hunting and guns and from a tutorial mission by an npc. Donating to street musicians and artists, giving free rides, meals and housing to hobos. $1,000,000 donated and hobos will be clad with fashionable clothes and their housing will feature street music and art. Rare Vehicles, wine and spirits, jewelry and watches. Buying them will increase your respect and open up new missions. Exproring the whole planet will make Jake's world seem smaller by giving him free trip skip in public transport so that he instantly arrives in his destination. Also every 10 % increment in map explored will grant him a 5% frequent flyer discount in commercial flight prices. Participating in a Cultural event will give him more respect, which will open new missions. You gain energy points for eating and drinking. Exceeding energy max 1000 ep will make Jake vomit everything he ate and drank before one game hour to the moment ep's were exceeded. You gain muscle for exercising, but you must have the energy points needed to gain muscle. You will lose muscle at the rate of 3 mp per day, and to stay fit you will have to exercise. Also, if you have 0 fp, and 0 ep and you lose energy points, you will compensate the deficit with loss of muscle points. If you have 0 mp, you compensate the loss of muscle points with loss of health points. You don't gain any muscle after you max out 1000 mp. Maximum time of gym usage is 2 hours per day. Using supplements increase the mp’s per exercise for two game hours at a time. Maximum 1000 fat points (fp). Your health is maxed out at 1000 health points (hp). You gain health by consuming medical aid kits and medicine. Also, every day you will heal at the rate of 34 hp per hour. You lose heath by physical damage to your body. If you have damage to your body, it will impair your ability to move. The more damaged you are, the more impaired your movement. At 800 hp your sprinting distance is halved, at 500 hp you are not able to sprint. At 200 hp you are not able to run. Below 100 hp you are not able to run, and walk with a limp. If you have lost at least 500 hp, you can gain health only up to 800 hp until you sleep. If your health declines to zero, you will be checked into a hospital. When you get checked out of hospital you are at full health again. Time spent in hospital will be skipped. Get it from a vending machine, street vendor or over the counter in a restaurant or café. I want it to be convenient, i.e. not limiting your other game play. Get them from vending machines, street vendors and over the counter in a restaurant, café or a club. -impairs your health by 1 hp per cigarette. You can only hear the stations on the same continent, so travelling to another continent will result in change of radio stations available. Louis Armstrong And the All Stars - Hello, Dolly! Jesse & Joy ft. Gente de Zona - 3 A.M.
Oxmo Puccino - Qui Peut Le Nier! Pjotr Tchaikovsky - Swan Lake, "Swan Theme"
Joseph Haydn - Symphony no. 45 in F# minor (Farewell), 1." Allegro Assai"
Ludwig van Beethoven - Symphony no. 5 in C minor, 3." Scherzo: Allegro"
Antonio Vivaldi - The Four Seasons: 3. "Autumn"
Wolfgang Amadeus Mozart - Serenade 13 in G major, 2. "Romance, Andante"
Joseph Haydn - Symphony no. 45 in F# minor (Farewell), 3. "Minuetto"
Pjotr Tchaikovsky - The Nutcracker, 13. "Walz of the Flowers"
Wolfgang Amadeus Mozart - Piano Sonata no. 11 in A major, "Rondo Alla Turca"
Johann Sebastian Bach - Orchestral Suite no. 3 in G major, 2. "Air"
Ludvig van Beethoven - Symphony no. 5 in C major, 1. "Allegro con Brio"
Antonio Vivaldi - The Four Seasons: 1. "Spring"
Peter, Bjorn & John - What You Talking About? Sudan Roots - Sudan Salam! Eric - Nǐ, hǎobù hǎo? Zone The Darkness - The N.E.X.T. Rau Def - Killin Em! Like in IV where Niko makes comments based on differing tv programs. Was this a thing in IV? I don't remember it and I know I watched a lot of television. Yes, "I'm Rich" and "History of Liberty" were mentioned by Niko in dialogue while talking to Roman. In comments like "I think you have watched too much of I'm Rich" and "You know I've watched some history of Liberty and everything in this city is owned by the same families." (maybe not exactly like that, but convaying the same message). 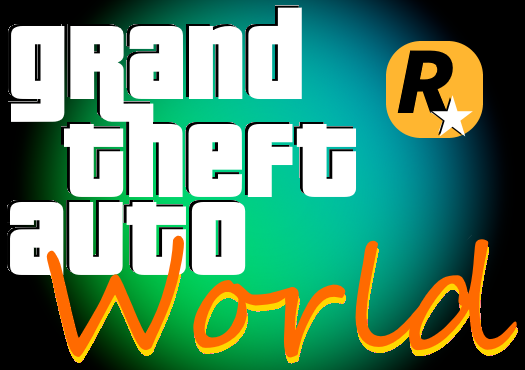 I know, this is just a concept, as in what I imagine it would be like if Rockstar ever GTAed the world. All I know is him mentioning "I'm Rich" but I can't recall him saying anything about The History of Liberty City and I hung out with Roman a lot. I'm not 100% that it was Roman who was told about the history of liberty, however 100% it was said by niko in IV to somebody as dialogue, but yeah the point was, that it has been done before, so not a new feature. Roman: We're going to make it big, cousin. Roman: I mean we're going to make it big. Niko: What's that? What's big? Roman: What I've been saying ever since I started sending you emails. We're going to be on top. Fast cars, Jacuzzis, hot women, we're going to have everything we could ever dream of. I can feel it. The cousins Bellic. On top of the world. Niko: Take a look at the history of this city, Roman. The old white men who run the city today, their fathers ran it before them, and their fathers before them. The same names are on the news buildings as that are on the old ones. Roman: Alright Mr. I-know-the-history-of-this-city, what is it that you want? What are you hoping for? Niko: To get by, to have a life that isn't totally sh*t, for things to be a little easier. You've been watching too much I'm Rich on the TV, cousin. Roman: No, I'm going to be on I'm Rich, cousin. If you're lucky, I'll let you come around my house when they're filming. They can shoot you in the hot tub. Niko: Great, thank you, I can't wait. Yes, well that's just irrelevant. Please stop posting if you have nothing else to talk about. Also the size of Canada is offputting but that's just me. "New" Liberty City? What happened to the old one ? I don't hate Canada, but as I commented when I made the North America map: It's a nod to the canadian policy that favors the most populous parts of the country and neglects the rest of the country. I admit that it's not representative of the whole of Canada, but I didn't include the whole of Finland either in the map, or Alaska. As a mapmaker it's my priviledge to do whatever I choose to make my maps. Nothing. It's simply New as in New York. It was suggested by a peer at the mapmaking thread. I don't mind it either way. It could have stayed the same, but I chose to change it. Do you really think that the North Korean government would let Rockstar put North Korea into a game like GTA (or pretty much any video game in general)? And they could have a parody, kinda like what the Just Cause series does. It's funny how most of the comments are about the map, which should already have been discussed in the mapping thread. Thanks for the support for my thread anyways. If this was going to be a mod, I'd imagine adding new vehicles would not be difficult, so you could have as many as you wish. But since this is a concept for a game I can't possibly have all the vehicles right from the start. - but thanks for the suggestion, maybe I'll add something. Since when do they need permission? I don't think Homefront asked for it. No, and other games used it too. I didn't want to make Korea bigger, so dividing it would have made both koreas too small. Also, I am against the tyranny of north korea because all they care is to stay in power, no matter how much the people suffer. I just signed in my account after a very long time, to tell you that your map is damn awesome. Maybe by 2500 there will be a game as detailed as your concept. No, I think there won't be gta in 2500. Maybe 2050 instead. Update: Songs to Vice city station, Lucayans station, Porto Bautista Station and Lima Station. Update: 7 new ultra fast boats in the vehicle section! Update # 2: Vienna radio station updated with songs.